it’s just different on one thing. “Blue” is mostly come from the flower border area unlike yellow from inside throat. That means youhave to make “Blue” border gradually spread inside to throat totally different with yellow from throat to border. To make Blue spread up from border to throat is pretty harder than making any color from throat to border. We accidentally found the first tiny blue border on year of 2007 and we gave her a name as “Jao Sua”. We found her in “Miss Thailand” (our popular 2007 variety) seedlings so we believed she was might get mutation from “Miss Thailand” with hidden gene. Her border has both tiny blue and splash fading white. On midyear of 2007, we crossed her with “Large Moonlight” by using her as mother and we came up with new flower got more spread and deeper blue border. New generation of Blue Adenium on border is developed by "Super Jao Sua"
We called her as “Super Jao Sua” and we were so glad at that time. 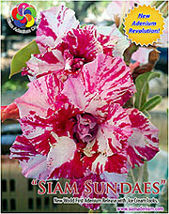 “Super Jao Sua” was our first cultivar to begin to make “Blue” adenium flower. As we knew, pure red petal is pretty stability and great to cross with other nice mothers because it’s not impact to mother characters e.g. colors and styles. For example, you want to make mother from pink and star style to become new variety with round shape and bigger flower but characters is still almost the same as mother so you should use round big red as father or pollen. Luckily we had one variety that has big fade red spread around border and her name was “Red Leo”. More Blue on petal area is used to back cross with Rosy Adenium : Red Sun to make another new Blue Rosy Adenium. This is new Purple-Blue flower so we can use her to develop to make new blue adenium as well. not only can help and benefit but also give more fun with Adenium’s growing to you. Now the rainy season here is almost gone. Our adeniums are very fresh and healthy. To grow Adenium Bonsai seedlings is different with adenium flowers because the hybrids are different. Most of them are from Thai Socotranum and Arabicum unlike Obesum for flowers' developing. I will share this article next time. Have a nice day and enjoy growing adeniums.